The regional Government of Catalonia has set a referendum on Catalan independence (Catalonia referendum) for 1 October 2017. This referendum was first called for in June 2017 and was approved by the Catalan parliament in a session on 6 September 2017 along with a law which states that independence would be binding with a simple majority, without requiring a minimum turnout. Opposition parties refused to participate in the session and have called on their voters to boycott the vote, except Catalunya Sí que es Pot who abstained but supports participation. The law is illegal according to the Catalan Statutes of autonomy which require a two third majority in the Catalan parliament for any change to Catalonia’s status. The referendum itself is also illegal according to the Spanish constitution. It was suspended by the Constitutional Court on 7 September 2017, with the Catalan government stating the court order was not valid for Catalonia and proceeding to gather the support of 750 of 948 municipalities of Catalonia, including a partial support by Barcelona. This led to a constitutional crisis in Spain and started a police operation to stop the referendum. The Government of Spain opposes any Catalan self-determination referendum, maintaining that the Spanish Constitution does not allow for a vote on the independence of any Spanish region while also deeming it illegal without its consent; an interpretation also favoured by the Catalan Statutory Guarantees Council. 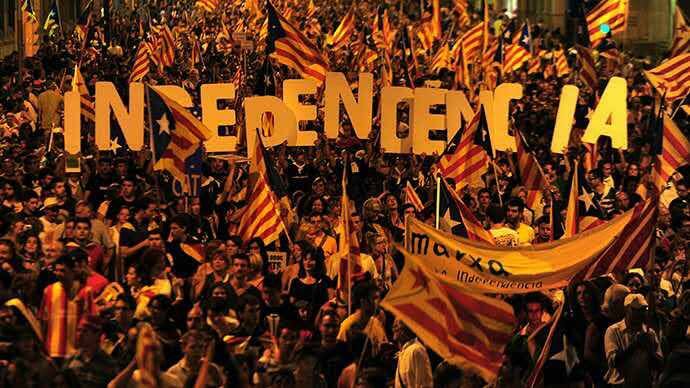 On the other hand, the Catalan government invokes the right to self-determination for calling the referendum. So far, the Catalan government has tried but failed to get international support; in particular, Spain’s European partners see Catalonia’s status as a strictly internal matter. Following a constitutionality check demanded by the Spanish government, the Constitutional Court of Spain annulled the resolution emanated by the Parliament of Catalonia to hold such a vote. The Government of Catalonia, though, maintains that the vote will still be held on 1 October. The Catalan government had aimed to thwart legal action on behalf of the Spanish government by rushing a referendum law through its own parliament, by simple majority, in September declaring that it would then follow a “Catalan-only” legality (as opposed to the general Spanish one). Spain’s deputy prime minister, Soraya Sáenz de Santamaría, had notified the Catalan government in advance that the state would strike down the referendum law right after it was passed. Pollsters generally started using the proposed referendum question (“Do you want Catalonia to be an independent state in the form of a republic?“) after it was revealed in early June 2017. The Centre for Opinion Studies (Centre d’Estudis d’Opinió, CEO) polled respondents on their intentions rather than asking them the actual referendum question. In its March 2017 poll, aside from asking respondents whether they would want Catalonia to become an independent state, it asked their intents in the event of a referendum on the independence of Catalonia being called and organised by the Generalitat without agreement from the Spanish Government. In a July 2017 poll a similar question was proposed, with the difference that it asked about the actual 1 October referendum. Previous post Sant Bhindranwale Termed ‘Terrorist’ in Maharashtra School Book ! !